Collections Etc - Long lasting up to six months or 300 gallons. Very easy to install with clear instructions. It also eliminates the odor and taste of chlorine, a chemical that is widely used as a disinfectant in water treatment plants. Delivers clean, clear water that looks and tastes great Uses revolutionized technology for water filtration, most of the impurities that water has are filtered away Protects the components of refrigerator from potential sediment Does not remove minerals which may be beneficial to health such as fluoride.
. This filter eliminates over 99 percent of potentially harmful contaminants that may be present in water, including lead, benzene, mercury, microbial cysts, and carbofuran. Compatible with following samsung refrigerator models: refsvc, rf26hfendsr/aa, rh25h5611sg/aa, da29-00019a, rf28hdedbsr/aa, rh25h5611sr/aa, rf260beaesr/aa, da-97-08006a-b, rf28hfedbww/aa, haf-cin, rf261beaeww/aa, rf263beaeww/aa, rf28jbedbsr/aa, rh29h9000sr/aa, rs25j500dbc/aa, rf28hdedtsr/aa, rf260beaeww, rf261beaesr, rf28hmedbww/aa, rf263teaesr/aa, rf263teaesr, rf23j9011sr/aacompatible smasung refrigerators:rf23j9011sr/aa, rs25j500dsr/aa, rs25h5111sg/aa, da2900020a, rf25hmedbww/aa, rf28hfedbsr/aa, rf24j9960s4/aa, rf23j9011sg/aa, rf28hfedtbc/aa, rf28hfedbsg/aa, da97-08006a-b, haf-cin-exp, rf263teaesg/aa, rf34h9960s4/aa, da-97-08006a, rf23hcedbbc/aa, rf23hcedbsr/aa, rf261beaebc/aa, rf28hmedbsr/aa, da29-00020a, rh22h9010sg/aa, rf4287habp, da-97-08006b, 46-9101, rs25j500dww/aa, rf323tedbsr, rf263teaeww/aa, rf260beaesr, rf28hfedtww/aa, rf4287hawp, rf260beaesg/aa, rf263teaeww/aa, rf23htedbsr/aa, rf4267habp, rf28hmedbbc/aa, 04609101000, rf261beaesr/aa, rh22h9010sr/aa, rf4267hawp, rf263beaesg/aa, rf23hcedbww/aa, rf263beaesr/aa, rf261beaesg/aa, rh25h5611ww/aa, rf4267hars, rf26j7500ww/aa, rs25h5121sr/aa, da2900019a, rs25h5111ww/aa, rf28jbedbsg/aa compatible with da29-00020b, rf4287hars, rf260beaeww/aa, rf263bEAESR, RS25H5111SR/AA, 469101, RF24FSEDBSR/AA, RF28HFEDTSR/AA, RF25HMEDBSR/AA, RF260BEAEBC/AA, RF26J7500SR/AA, haf-cinexp, HAFCIN. 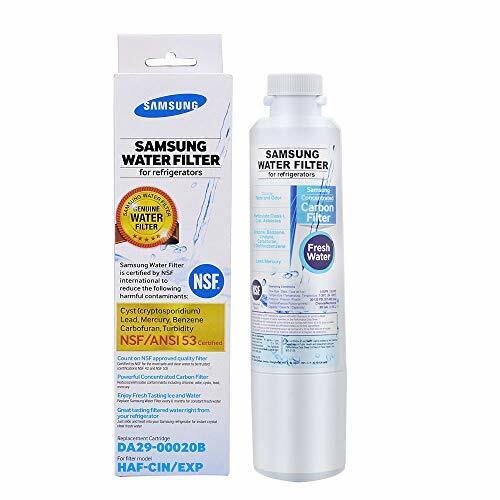 Samsung DA29-00020B, DA29-00020A, HAF-CIN EXP Premium Refrigerator Water Filter 1-Pack - Tested and certified by nsF International, a non-governmental organization dedicated to public health, safety, and environmental protection. High grade carbon block, that removes over 99% of numerous potentially harmful contaminants which may be present in your water. Samsung Da29-00020b-1P - This filter uses a powerful concentrated carbon filter to eliminate over 99 percent of potentially harmful contaminants. Shipping note: shipping to PO Boxes and APO addresses is not available for this item. Samsung genuine water filters are guaranteed to reduce contaminants, for fresh-tasting water. Product dimensions : 2. 13 x 2. 13 x 8. 86 inches. See product images for both versions of packaging. All samsung water filters are tested and certified. Remove over 99% of numerous potentially harmful contaminants, using a high grade carbon block. Samsung genuine refrigerator Water Filters give your family clean, fresh water, while protecting your refrigerator and home from potential damage. Samsung Da29-00020b-1P DA29-00020b Refrigerator Water Filter 1 Pack - . Samsung genuine filters are produced in both Korea and Mexico. Product comes in two package types. Filtrete 3US-MAX-F01 - Product dimensions : 2. 13 x 2. 13 x 8. 86 inches. Maintains high full water flow rates of 1. 5 gallons per minute on your existing kitchen or bath faucet. Maximum, advanced and standard replacement filters are interchangeable with system. 1/4 turn filter change replacements. Filtrete™ replacement filter for maximum under-sink water filtration system is designed to reduce lead, and sand, microbial cysts, sediment, chlorine taste & odor, rust & soil. 1/4 turn change filter replacement lasts 6 months or 1500 gallons. This product is intended to be used on a potable cold water supply only. See product images for both versions of packaging. All samsung water filters are tested and certified. Remove over 99% of numerous potentially harmful contaminants, using a high grade carbon block. Filtrete Maximum Under Sink Water Filtration Filter, Reduces 99% Lead + Much More 3US-MAX-F01 - Maximum level filtration reduces 99% lead, 97% chlorine taste & odor, sediment, 0.5 microns of sand, 99% microbial cysts, rust & soil. Tested and certified by nsf international against nsf/ansi standard 42 and 53 in 3US-MAX-F01 3us-max-s01 for the reduction of the claims specified on the performance data sheet. Samsung genuine water filters are guaranteed to reduce contaminants, for fresh-tasting water. Product comes in two package types. - Lounge away in the softest velour lounge robe for men that doesn't skimp on quality. Available in s-XXXL to comfortably fit most body sizes. Priced to give you the best value for money. You'll love the great attention to detail that has gone into making the men's lounging robe, and all at a price that can't be beaten. Comes with 2 patch pockets for a touch of functionality. This product is intended to be used on a potable cold water supply only. 1/4 turn change filter replacement lasts 6 months or 1500 gallons. The lounging robe you won't want to take off cozy up house robes don't get any softer than this! We've used ultra-cozy velour knit fabric made using 100% polyester to create a robe that feels as snug as it looks. #followme Ultra Soft Velour Robe for Men with Hood - Enjoy unmatched durability Coziness is nothing if it doesn't have the durability to match. Product dimensions : 2. 13 x 2. 13 x 8. 86 inches. Strong stitching and perfectly-lined hems also combine to create the most durable velour men's lounge robe. Unmatched value for money: #followme prides itself on giving you the latest styling at the best value around. See product images for both versions of packaging.